It is time for another episode of WGTC Radio, the official podcast of We Got This Covered! Remember to subscribe for free in iTunes by following this link! 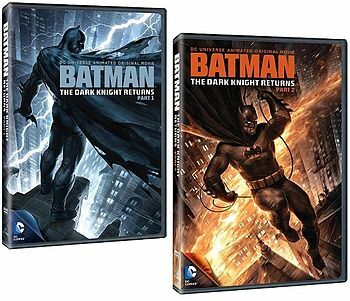 Last week, the second installment of DC Animated Universe’s 2-part adaptation of Frank Miller’s acclaimed graphic novel, Batman: The Dark Knight Returns, arrived on DVD, Blu-Ray, and digital download. The title is probably of interest to our audience, we figure, seeing as Batman happens to be a fairly popular character these days, and The Dark Knight Returns is one of his most famous stories. Now that both parts of the film have been released, we thought now would be the perfect time to review the full, two-and-a-half hour experience, as well as return to the original graphic novel and offer our thoughts on the story itself. In our discussion, we talk about the book’s place in Batman history, what we think of the book and Frank Miller as an author, and, of course, offer a full review of how the 2-part film stacks up.